Contemporary Italian cinema is gaining more momentum worldwide with each passing year. When I began writing for Fra Noi back in 2004, I could count on one hand the contemporaryItalian film festivals held in America. Fast forward to 2015, and there are dozens of film series and festivals across the United States that showcase the newest trends in Italian cinema and culture. The popularity of all those series and festivals are grabbing the attention of film distributors, leading them to discover how much Americans really enjoy a good Italian movie. Francesco Munzi’s “Anime nere” (Black Souls) is the latest example of this momentum. The film gained international acclaim when it premiered at last year’s Venice Film Festival, and it is now scheduled to make its U.S. premiere in Chicago onSaturday, March 14th at 5:30pm at the Gene Siskel Film Center. The film will be featured in the 18th edition of the AnnualEuropean Union Film Festival. It will then be released nationwide on April 10th. 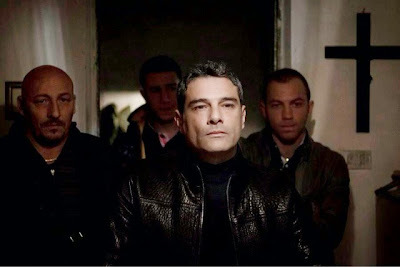 “Black Souls (Anime nere) is an unprecedentedly authentic depiction of the Calabrian crime organization known as the’Ndrangheta. The film pits brother against brother when a young man turns against his law-abiding father in this powerful, Greek-tragedy inflected family drama. The film, adapted from a novel written by Giocchino Criaco, and directed by one of Italy’s most celebrated young directors, Francesco Munzi, features a remarkable cast of contemporary Italian cinema talent. You may even recognize cast member, Marco Leonardi from Giuseppe Tornatore’s beloved “Cinema Paradiso”. “How Strange To Be Named Federico: Scola Narrate Fellini” will also be shown at the 18th edition of the Annual European Union Film Festival. Scheduled on Saturday 3/28 at 5:45 PM and Thursday 4/2 at 6:30 PM, it is the official closing film of the festival. Directed by Italian cinema icon, Ettore Scola, this unconventional portrait of Federico Fellini is neither documentary nor fictional biopic, but an imaginative, highly personal tribute from a major director who not only admired and knew Fellini, but also used him as a role model. Both films are in Italian with English subtitles. For more information about the European Union Film Festival, visit http://www.siskelfilmcenter.org/eufilmfest2015.